All MNC TV makers are working very hard to make their TVs smarter than ever before. The latest technologies like LED backlighting and OLED technologies made the pictures more vibrant. Moreover, Wi-Fi connectivity enables your TV to interact with your smartphone. However, it seems like all such shrewd advancement is just the tip of the iceberg. Many more new astonishing breakthroughs are still on the leash. A few of features, that are on the drawing board, that made me dumbstruck is eye controlling technology (No need of remote, you can change the channels with your eyeballs). The transparent and flexible displays that are portable and suited anywhere is yet another feature that fascinated me the most. Apart from this, I think the real game changer will be the integration of virtual reality headsets. Without any doubt, we can confidently say that all these futuristic technologies will make our TV time extremely exciting. When we are deciding to buy a TV, we should think about future changes in technology. You must be aware that smart TV, like the smartphone, uses software which will get updated to the new one and the old one will get obsolete. You must decide, either to live in the present and buy the latest smart TV by paying an exorbitant price. Or you can hold your curiosity for one or two years and wait for the new technology to emerge. Meanwhile, if your wants are on high alert until the companies unravel the new technology, you can choose any budget TVs. It is true that most of the budget TVs can’t compete with the street smartness of the latest technology, but they can stand against any smart TV for their quality and durability. Keeping this in mind, I’ve done a thorough search to find out the best budget TVs available in the market. My search culminated in a love affair with a product named Kevin TV. One of the reasons for the instant liking for this less known brand, Kevin, is its unpopularity itself. They use less advertising than their counterparts. As far as consumers are concerned, the advertisement neither contributes to the utility nor quality. What worth in a product, is its longevity and consistent performance. Let us find out more about this brand. Kevin TV is manufactured by an Indian company, registered under the name Beston Sky Vision Pvt. Ltd. According to their website bestonskyvision.in, they are aiming to trespass into one of the top five TV brands lists. They are claiming that their focus is long term, so they emphasize on quality rather than quantity. 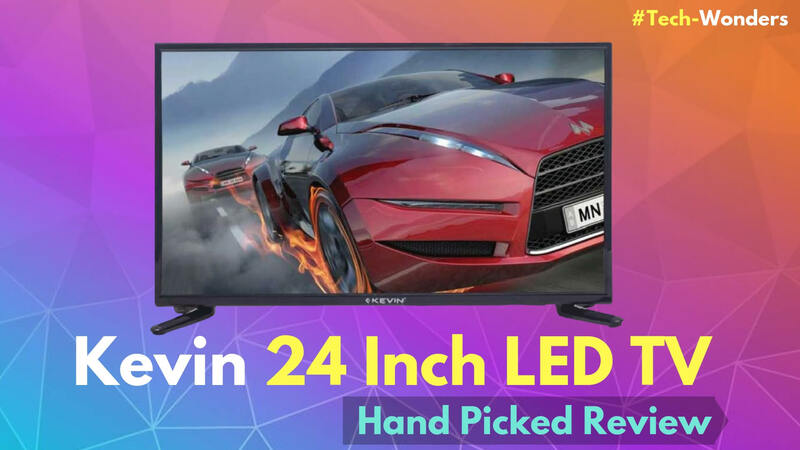 So let’s go through Kevin 24-inch HD Ready LED TV and find out what are its important features that need your attention. Kevin TV has an A+ grade panel. The secret behind Kevin TV’s life-like color and wide viewing angle is the A+ grade panel. 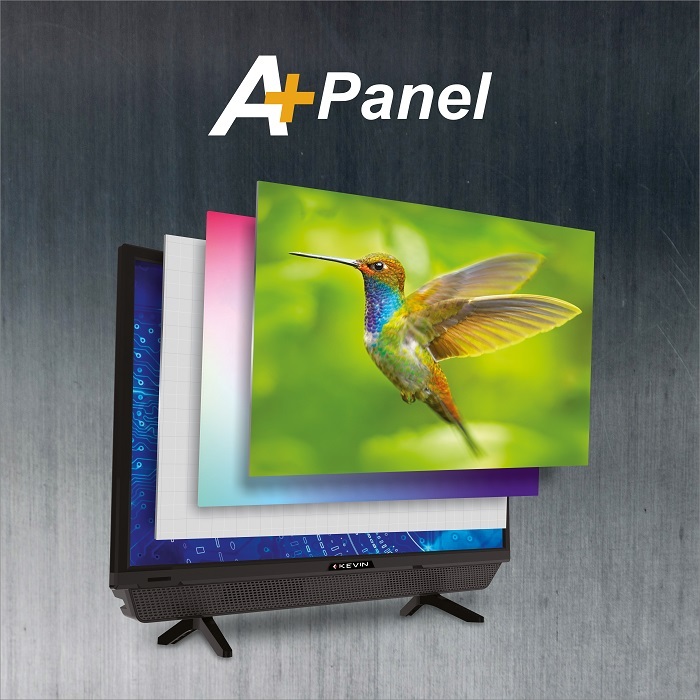 It’s nothing but a zero defective pixel guarantee received from the panel manufactures to the TV manufacturer – that means in case of any single defective pixels the panel can be replaced with new one. Remember an image on your screen is a compilation of millions of pixels. What this all means to a consumer is there won’t be any single black and blank dots on the screens. It comes with a wide viewing angle of 178°/178° that lets you watch your favourite shows from any angle without any blur. Free from color wash and picture fade, it is the ideal panel for all purposes. In addition to A+ display panel this Kevin TV also utilized HRDD technology. HRDD technology enables an excellent picture quality. 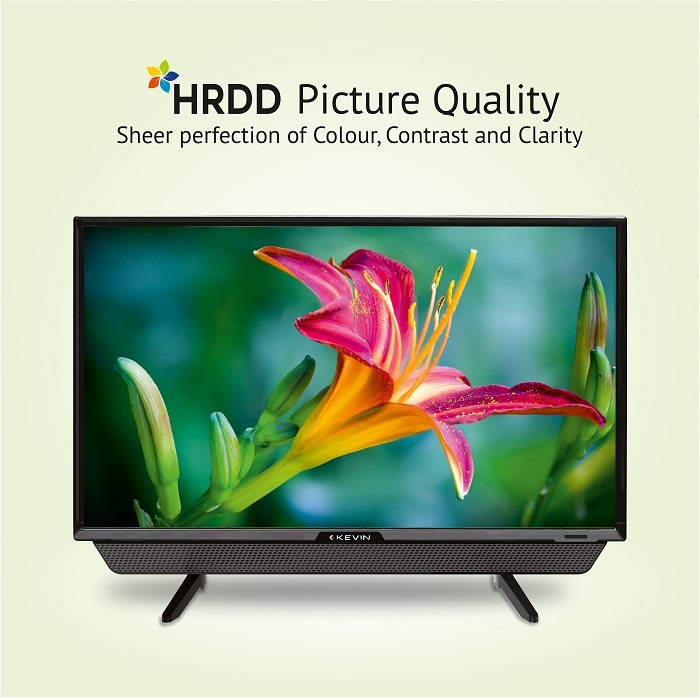 Both A+ panel and integrated HRDD technology are synonyms for the picture quality, so assures vivid frames. When A+ panel dispels black dots by energizing every pixel, the HRDD technology optimizes those pixels, to give off a remarkable picture quality. This Kevin TV has a resolution of 1366 x 768 pixels. That means, in the A+ panel there will be 768 rows of pixels, and in each row, there are 1366 pixels. Thus the 24-inch screen has made of 1,049,088 pixels. Not that each pixel will be explicit to our naked eyes. But relying upon a magnifying glass will make those tiny pixels apparent. HRDD technology and the 1366 x 768 resolution allow for excellent picture quality, colour and contrast. It has a motion blur rate of 120Hz, that means an action movie will play without any sluggishness. 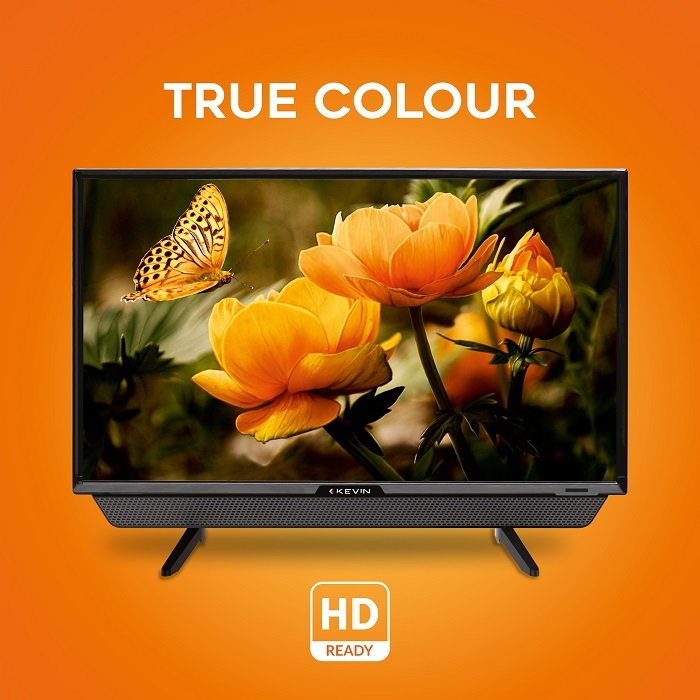 True Color technology and HRDD technology in Kevin TV works together to deliver the best color quality, ensuring that whites appear brighter and darks appear deeper making the image colour crystal clear. The main advantage of this Kevin TV is, it consumes less energy than the power guzzling smart TVs, as the latter embraced the IPS panels which consume an immense amount of energy. Precisely because of this reason, their response rate is also very high. 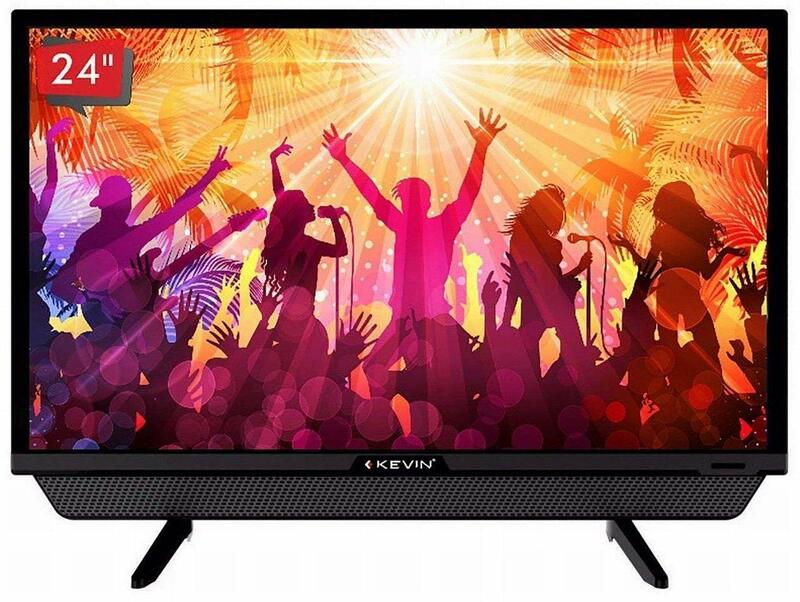 This Kevin TV will consume 39 watts of power and has 20 W speaker output that delivers an excellent quality sound. 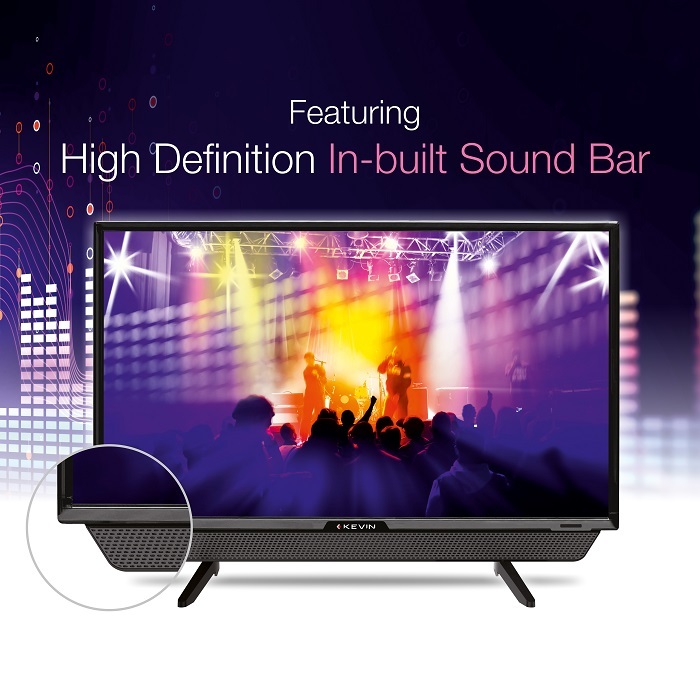 The front firing inbuilt sound bar ensures crisp and clear sound. Another exciting feature is the wireless headphone support that enables you to hear your favorite songs and watch movies using a wireless headphone. 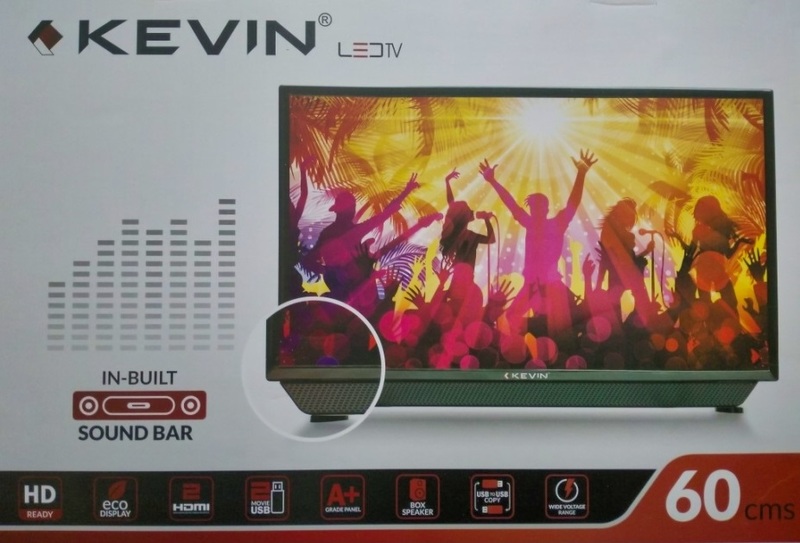 In Kevin 24 Inch LED TV there is a pre-set Cinema Mode for home theatre experience. Using this feature you can toggle between different visible screen sizes as per the video and watch your videos on the best suited zoom mode. This Kevin TV has 2 HDMI ports, 2 USB ports, 1 VGA Port, LAN, RF in, PC audio and coax audio. 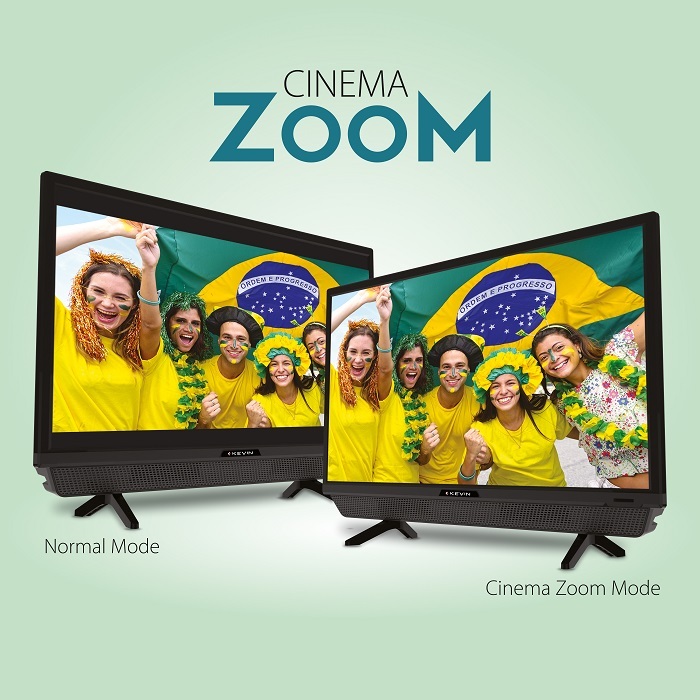 You can play all your favourite movies, videos, music on your Kevin TV by connecting your device via HDMI or USB port. VGA port enables you to use this TV screen also as a PC monitor. 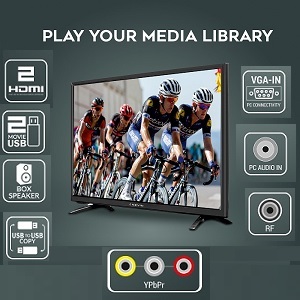 As this TV has got only 2 HDMI ports so in case you need more for connecting Blu-ray or game console it is better to use an HDMI auto split switcher. With the help of such add-on devices, you can split one HDMI port into three. So more often you don’t necessarily plug on and off from the inbuilt ports. This TV also supports “USB to USB Copy” function that enable you to directly copy files from USB to USB. It provides convenient on-screen content browser that helps in easy access of multimedia content. Kevin TV is lightweight. Since the weight of the TV is 4.98 Kg, you can easily carry around this TV in your home, indeed a cute weightless TV.